30 | November | 2014 | ReconfigurED. 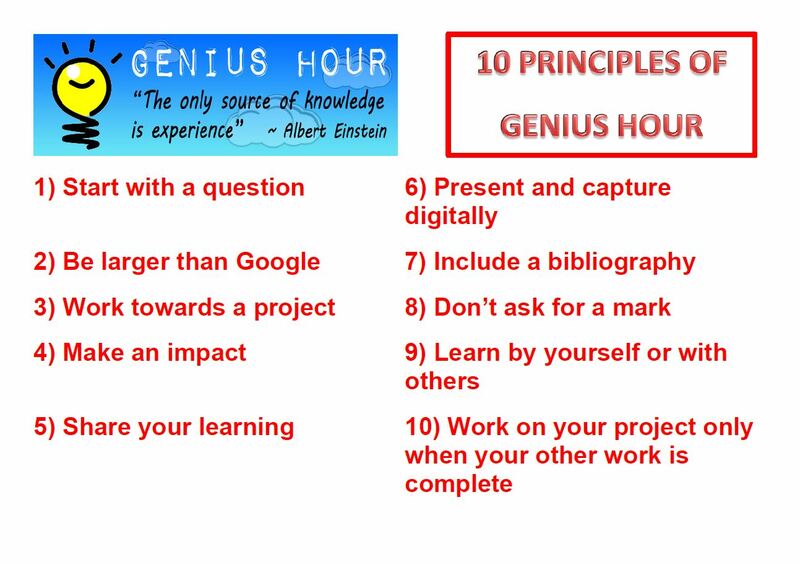 One of the 10 principles of our approach to Genius Hour which we maintain to be of high importance is to encourage students to have an impact beyond themselves. We want our students to think about how they could potentially change the world, whether that is on a local, national, or global stage. We are bringing the expectation that they could contribute something meaningful as a global citizen. What we found in our first iterations of Genius Hour last year was that this notion was hardly realised. Students unsurprisingly grappled with the foreign concept of undertaking a lengthy process of discovery on a deep level, let alone considering what they were going to do with their new found knowledge in the inquiry. This improved in 2014 as we applied a Design Thinking process to Genius Hour to focus on the development on a deep, complex and “Non-Googleable” question. The introduction of “How might we…” led naturally to tangible actions that could potentially lead to opportunities for sharing beyond a student’s own benefit. 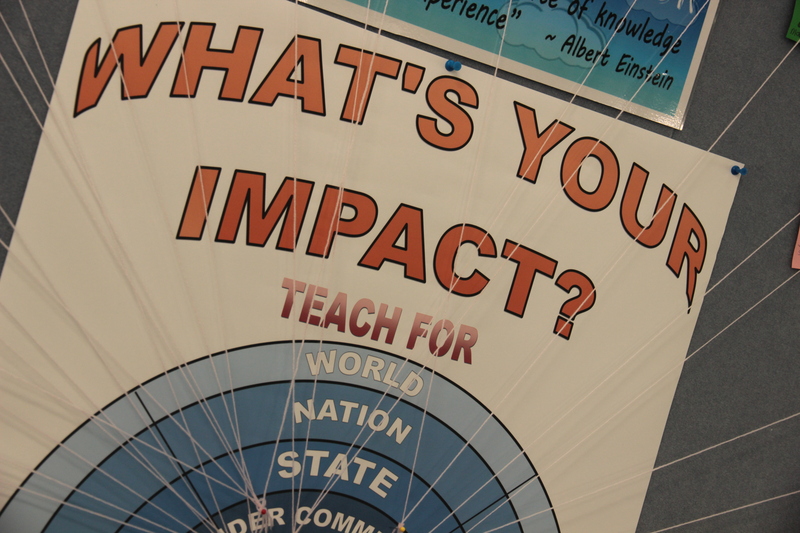 During the proposal stages students considered what the impact beyond themselves would be. However when it came time to undertake the inquiry, students became caught up and often forgot about it and therefore was often too little and too late in the process for their impact to be realised. Having said this, in our most recent Genius Hour attempt the majority of our students were able to at least make, teach or do something genuine for their school and wider community. Holding an Open Expo for the school community, and sharing projects via the level blog and on Google Hangouts certainly helped in this regard. 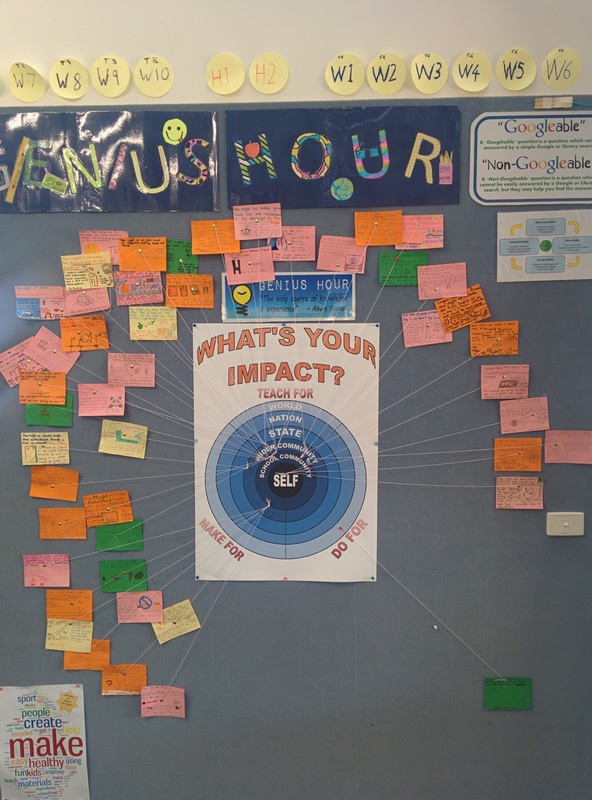 We asked our students to map out a self-assessment of their impact using a graphic organiser with the levels of SELF, SCHOOL COMMUNITY, WIDER COMMUNITY, STATE, NATION and WORLD by providing evidence of what they either made, did or taught. Upon completing this task, students reluctantly realised that their intended impact may not have been entirely realised. In our next attempt of Genius Hour, we feel that it would be appropriate to use this graphic organiser during the ideation stage and development of the inquiry line. 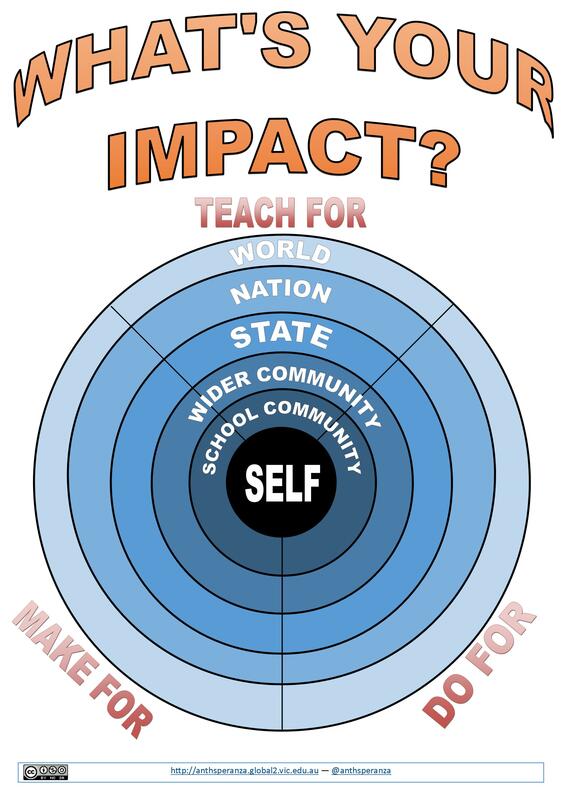 Our challenge as educators is to assist students during the inquiry process to connect them to opportunities that allow them to make their desired impacts, particularly those outside of the school community. Below is a copy of the graphic should you wish to use it (or in PDF). I would be interested in hearing about how other educators are encouraging their students to think beyond their community and actually making their efforts a reality!